Hair, an extremely personal thing. Every person wears there hair differently expresses themselves through there hair and struggles with what will suit them. 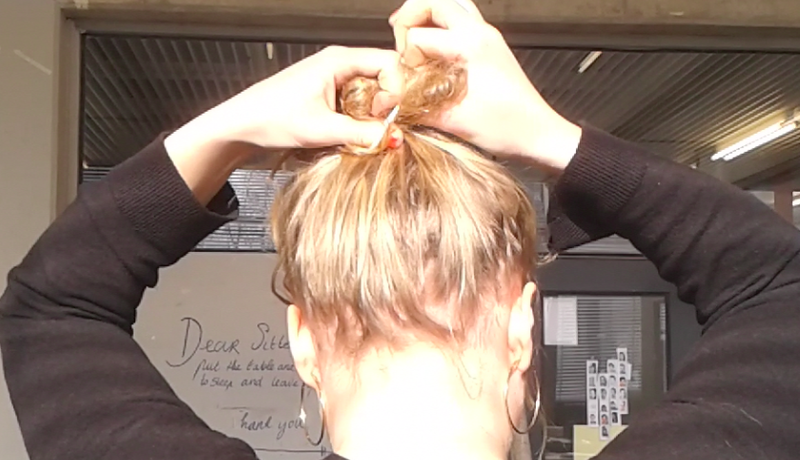 One style that has suited me very well is the bun, a style that is universally used by all long haired girls. 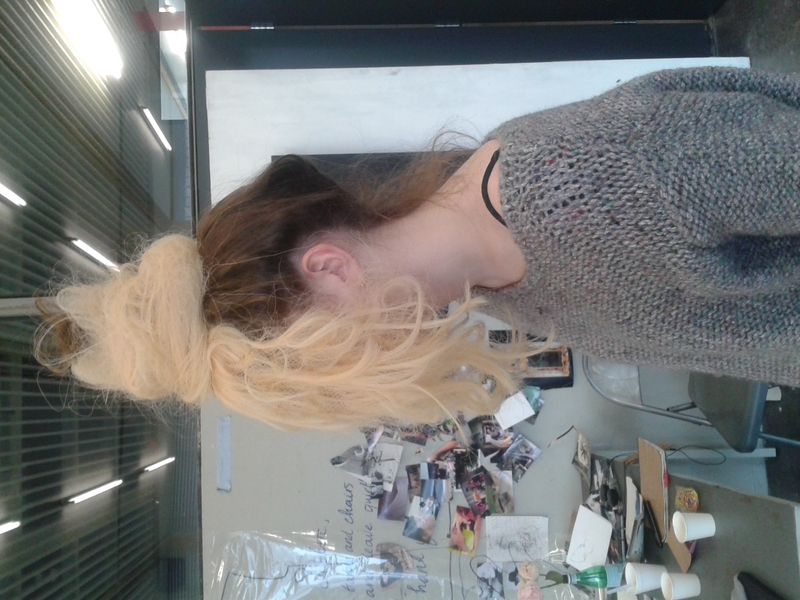 In the Rietveld the bun is used often. 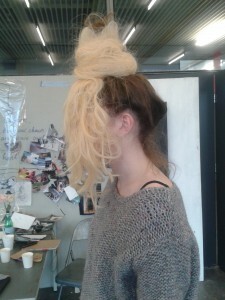 It differs from high in the sky to a low and tightly rolled bun. While observing the buns of the rietvelders it occurred to me that our buns can be compared to some sort of landscape. An always alternating landscape in which we can feel at home, personalized and detailed to fit our character. I personally wear my hair as a wild mountain like a high peak that just allows the mountains to peak out from the masses of the mountain filled horizons. 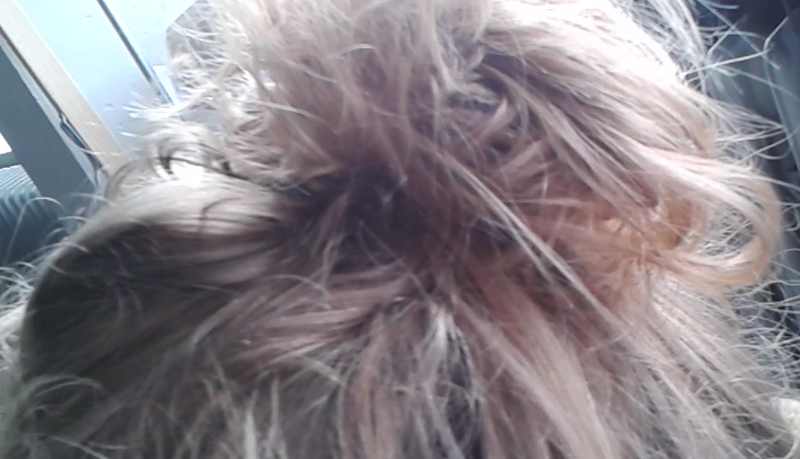 Others wear there bun as a field meticulously organized by the farmer. In the English definition of a “knot” (the way of saying bun in dutch) it stated that a know maybe a complex problem, but also a unifying bond and a feeling of tightness. I think that this contradiction shows exactly how people use the bun, and depicts exactly what i believe to be some kind of conclusion to the short video collage made above. When transforming my research in to a 3d product I focused on two aspects. 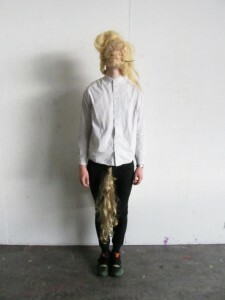 Using hair as the medium of choice and exploring on how I can translate my idea on how hair is a landscape. 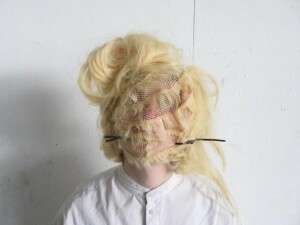 Using a wig, i tried to place the wig in such a way that it became a part of the body by overtaking other parts of the body. This photo is an example of my process, I chose to let the hair take over the face as a mask having a longer suspense to come to final bun. I transformed the hair in such away that the hair became a sort of man constructed field. Using the mask idea as a basis, I hoped to develop the aesthetics of the mask. 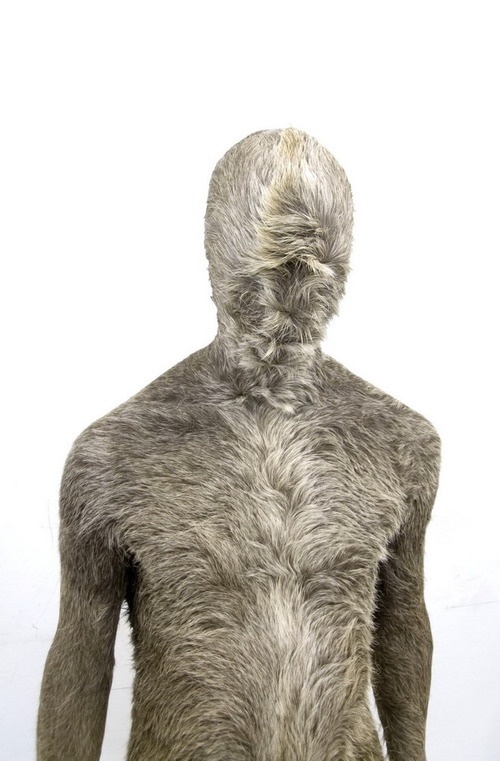 Markus Leitsch uses the same starting point covering a person with hair, the person becomes somewhat of an animal. This is a very direct relation to landscapes, by dehumanizing the person the concentration lays more on the piece. This piece by Markus Leitsch is shown on the left. Its a very direct relation to the fur of an animal I really like how there is a certain movement in the hair. The movement that he has created also leads to the head, where the hair then comes together. My final product became somewhat of a costume. I focused treating the hair as if it was a man made landscape, a corn field. I racked the hair, cut the hair for harvesting and collected some hair as if it was a hay stack to save for the winter months. This resulted to a somewhat fairy tale like piece. An absurd mask taking over the face with the main focus on the top of the hair where a bundel of hair lays lively. For the presentation of the piece as part of the fashion show I chose to present it on a male. As mainly woman wear there hair long it would create a distance from my initial research and allow the piece to speak for its self. I add a loose piece of hair on his pants unifying the outfit he was wearing and showing the build up from the bottom to the top of his body.